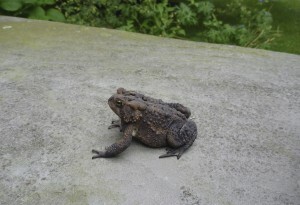 At Saltonstall, artists and writers can spend days any way they choose. We offer uninterrupted time, a quiet studio space, and a beautiful setting of hills and meadows to help our residents focus on their work and process. What comes out of these unstructured days is sometimes surprising but always inspiring. We are proud of our residents and everything made at Saltonstall: the opportunity, the community, the work. Here are just some of the latest examples. Take a look! Stephen Kuusisto’s (’15) most recent book, the memoir Have Dog, Will Travel, was published in March by Simon & Schuster. Read a wonderful Q&A with Steve published in The Bark. 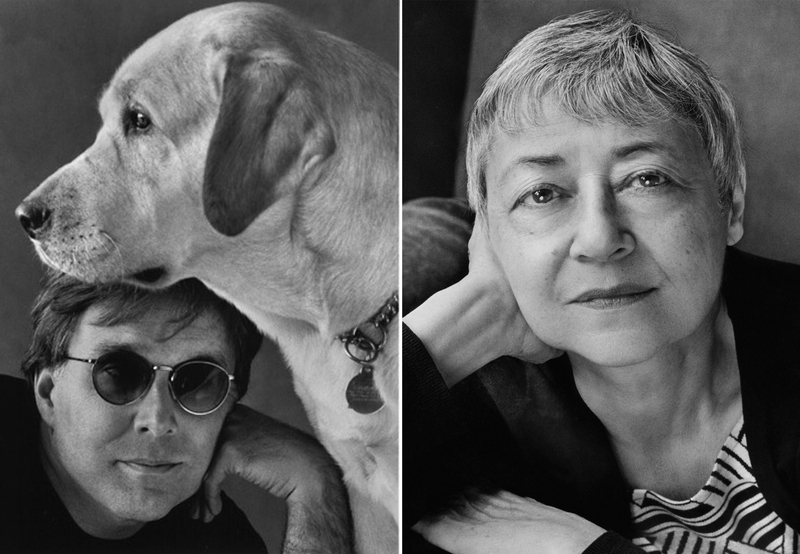 Sigrid Nunez’s (’16) new novel, The Friend — a moving story of love, friendship, grief, healing, and the magical bond between a woman and her dog” — was published in February by Penguin Random House. This dog-loving reading will also feature some special, furry guests: guide-dogs-in-training from the Finger Lakes Chapter of Guiding Eyes for the Blind. Writer Lisa Ko (’10) returned to Ithaca’s Buffalo Street Books where she read excerpts from her critically acclaimed book The Leavers. Lisa is a writer and editor living in New York City. 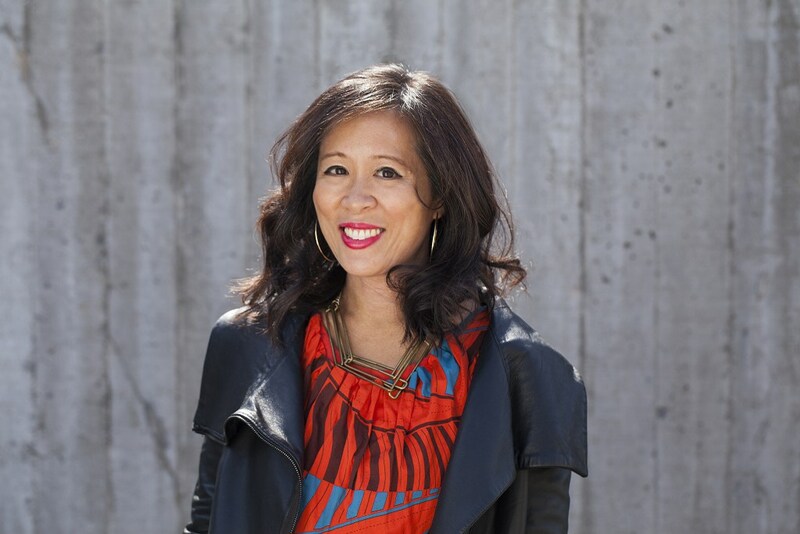 Her fiction has appeared in Best American Short Stories 2016, Apogee Journal, Narrative, Copper Nickel, Storychord, One Teen Story, Brooklyn Review, and elsewhere. 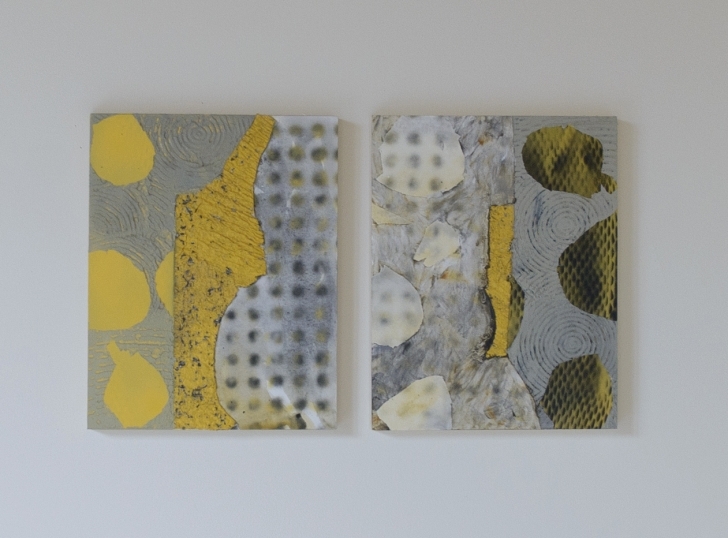 Portions of The Leavers were crafted during Lisa’s residency at Saltonstall. The Leavers was long-listed for the 2017 National Book Award for Fiction. 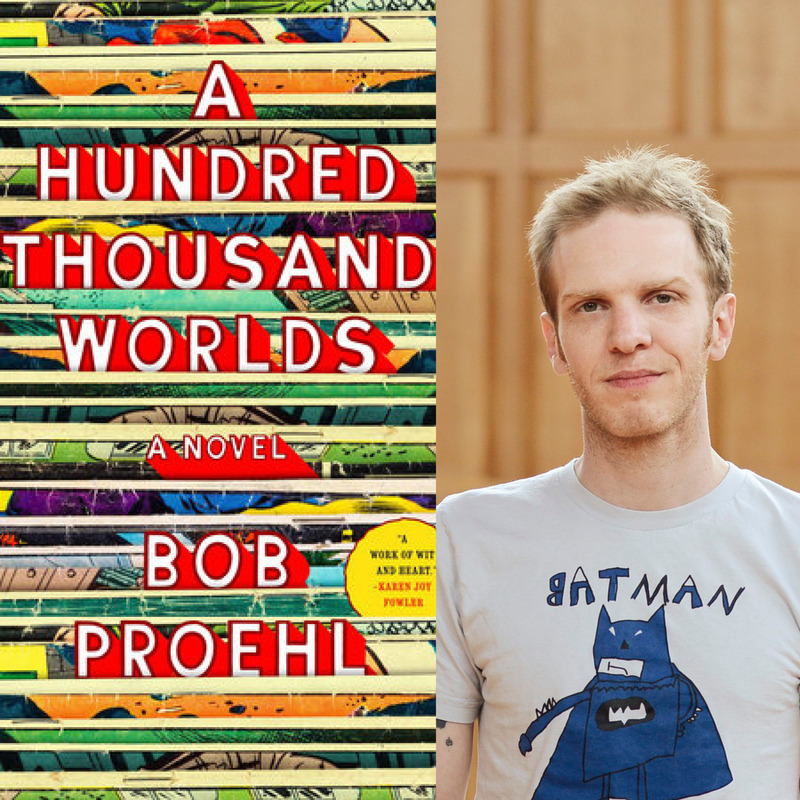 Bob Proel (’13) launched his debut novel, A Hundred Thousand Worlds, on June 29th, 2016. Bob is an Ithaca writer, friend, and current Saltonstall board member. 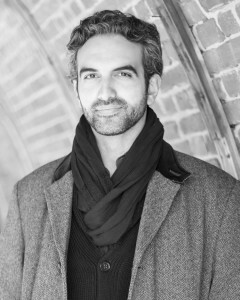 He completed the first draft of this highly acclaimed novel during his 2013 residency. 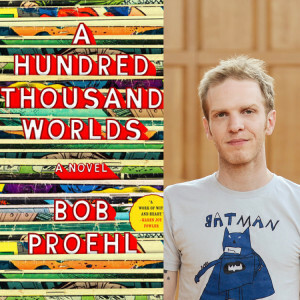 Bob has been doing a lot of traveling around the country to support the book, and he has upcoming readings scheduled in Brooklyn, Boston, MA, and in Buffalo, NY. Check his events page for additional announcements. 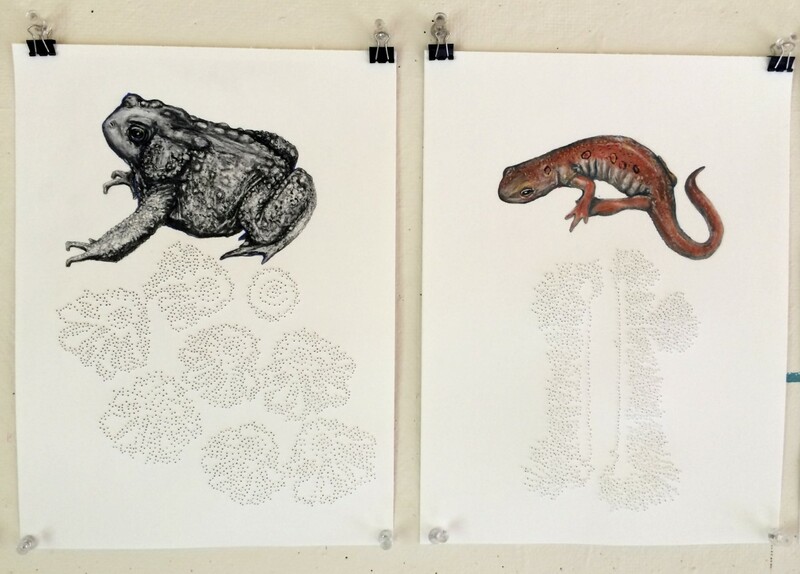 Tanya Chaly (’14) will have a drawing from her suite, “Paradigms and Harbingers” on display at the Art Gallery of Ballarat in Australia. Out of 445 submissions received, Tanya’s drawing was one out of 65 to be selected and put on display as a nominee for the Rick Amor Drawing Prize. The exhibition opening and award announcement will take place on July 8th at 6pm. The exhibition runs through October 2, 2016. Tanya created the featured drawing of a toad during her summer residency at Saltonstall after finding a toad on patio of our main house, taking a picture of it, and sketching it in her studio. Congratulations and good luck, Tanya! 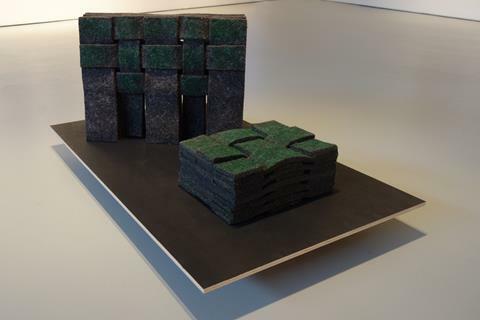 Three sculptures by Laura Kaufman (’15) are in an exhibition called CAMPSITE: Hudson Valley Artists 2016, which is on view from June 18th- November 13th, 2016 in the Dorsky Museum in New Paltz. 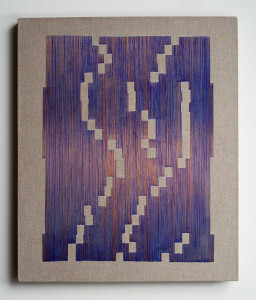 Laura began creating these embroidered, woven, and colored pieces during her residency at Saltonstall last summer. 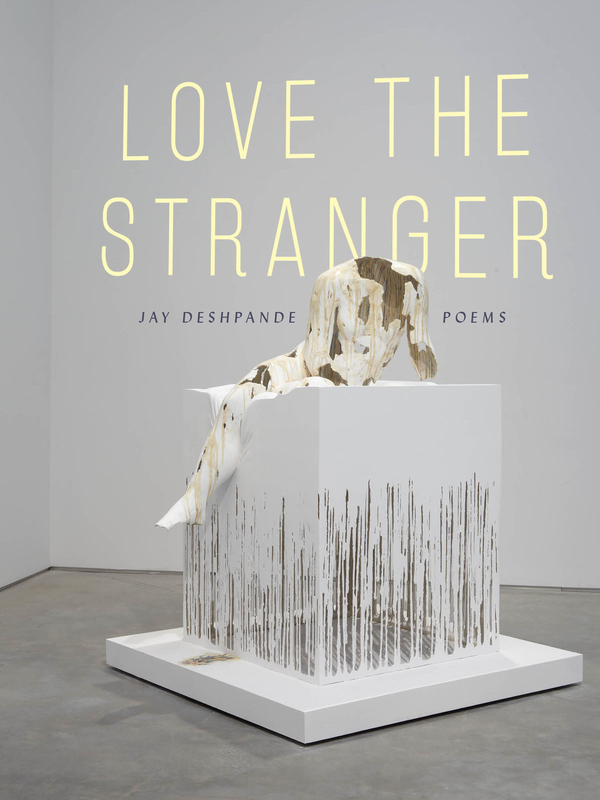 Jay Deshpande (’13), held a reading and book signing of his first full-length poetry collection, Love the Stranger (YesYes Books) on April 30, 2016 at Buffalo Street Books as a part of Ithaca’s Spring Writes Literary Festival. 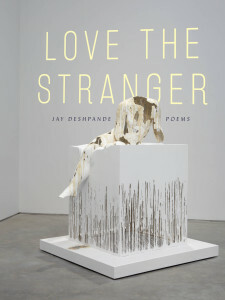 Jay wrote key sections of Love the Stranger during his 2013 residency at Saltonstall, and returned to Ithaca to read sections of his collection, which was named one of the top debuts of 2015 by Poets & Writers. 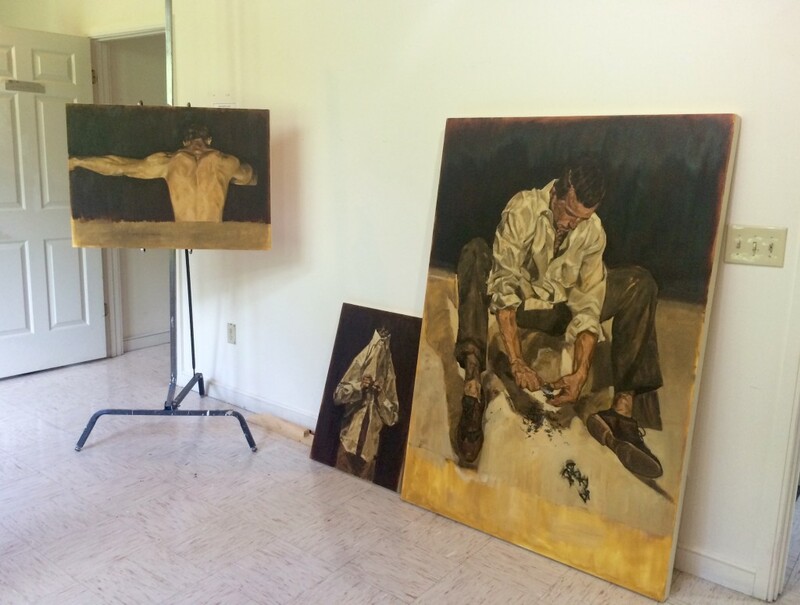 “Whittling” by Samuel Guy (’15), pictured in the image above, far right, was painted during Sam’s residency last summer. We are so proud that this piece was selected to be part of the 75th Regional Juried Art Exhibition at the Arnot Art Museum in Elmira. “Whittling” will be on view in the Museum’s West Building from April 15 – August 13, 2016 in the Museum’s Falck Gallery. The Arnot Art Museum is open Tuesdays – Fridays, 10 -5 pm and Saturdays 12 – 5 pm. The Museum is located at 235 Lake Street, Elmira, NY. 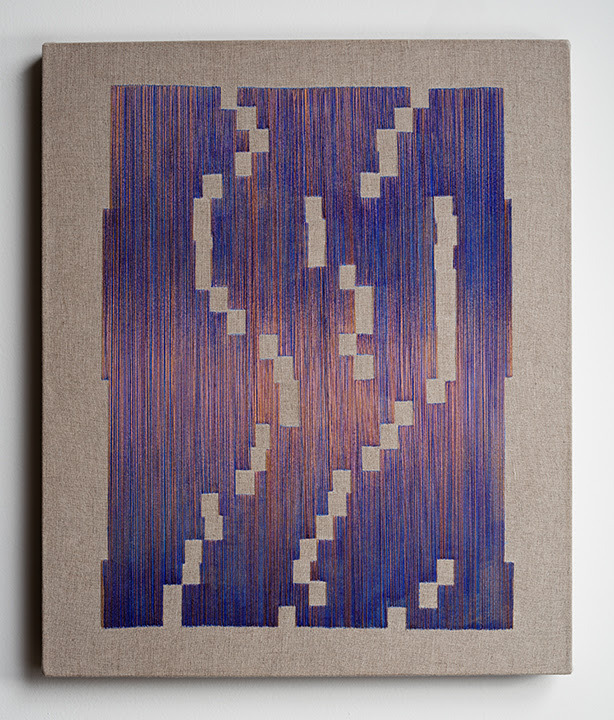 During her residency at Saltonstall, Laura Kaufman (’15) created the two embroidered samplers pictured here. These works, based on dark matter reporting, were included in a multimedia exhibition on art and feminism in the 21st century at Salisbury University in Salisbury, MD. Being Her Now: Feminine Identity in the 21st Century was on view through March 26. 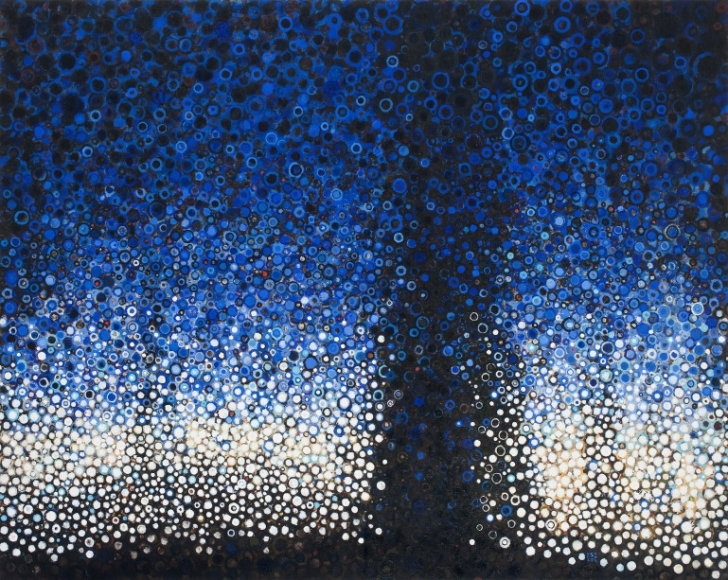 This painting by Randall Stoltzfus (’04) was started at Saltonstall during his residency, completed in 2009, and became part of a solo exhibition at the Winter Center Gallery at Millersville University (outside of Lancaster, PA) in 2015 that closed December 12. 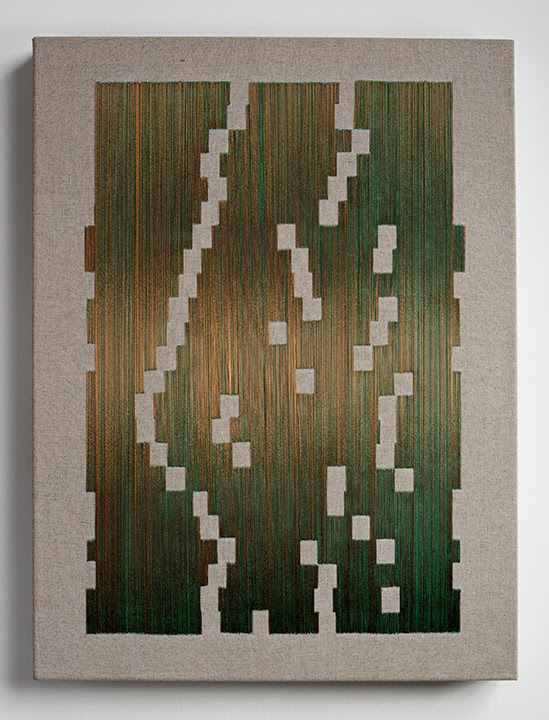 Lisa’s work is “site-inspired,” as she describes it. She figures out what her subject matter is going to be once she’s arrived in a new place. This means she is also open to the unexpected, and when a few very windy days prohibited her from painting outside, she began to think about the wind. How does one attempt to paint the wind, she wondered. “I mean, what is it?” she laughed, trying to envision painting something invisible. Intrigued with the idea of how a painter might capture the raw energy of wind, Lisa tried something new. 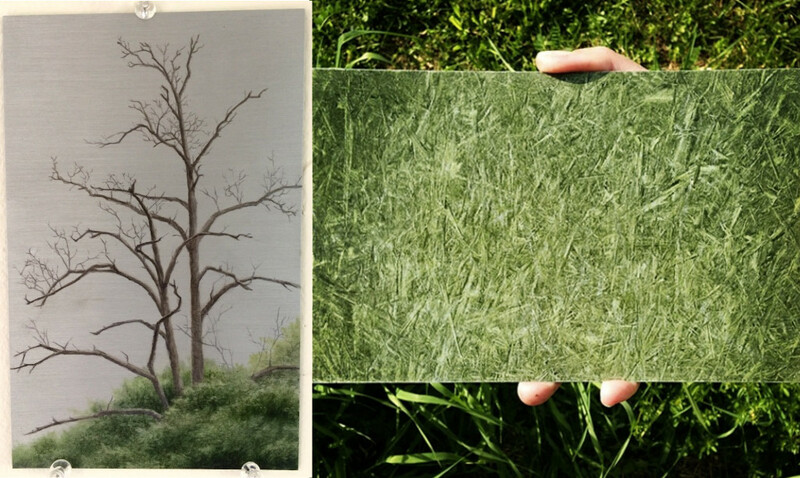 On one of those windy days, she painted thin aluminum panels (her material of choice) a bright green and — while still wet — gently held the panels over the waving grass, allowing the individual blades to brush the panel’s surface. The result can be seen in the image on the right, photo courtesy of the artist. Visual artist Jane Sangerman (’14) participated in our very first two-week residency session this year. 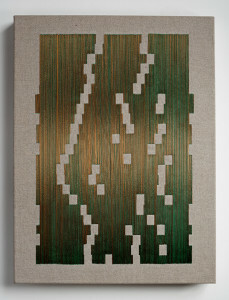 She created a number of new works during this time, including “Road No. 1” and “Road No. 2” (above) which included actual pieces of Ellis Hollow Creek Road. “As the other Saltonstall Fellows hiked in the woods, beckoned by their raw beauty, I took to the roads for inspiration. I was hopelessly drawn to what were once bright cadmium yellow dotted lines running down the center of Ellis Hollow Creek Road but were now ravaged by snow plows and left to fade in their shredded state. 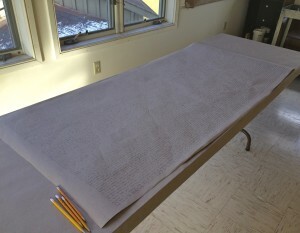 Poet Jaime Shearn Coan (’12) returned to the colony for a long stay last month. One day, Jaime came by the office with fresh baked bread and asked if there was an electric pencil sharpener handy. “I stopped up a few days later and was completely surprised,” says director Lesley Williamson. Over the course of three days, Jaime had filled four feet of butcher paper with a hand-written essay (seen above). “Jaime said he’d been thinking about Robert Walser,” says Williamson. Walser (1878 – 1956) was an eccentric, prolific Swiss writer who developed his own “microscript” – often using pencil – fitting whole texts into spaces as small as a business card. 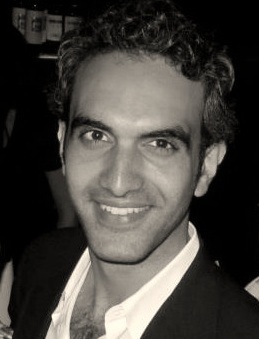 Currently working on a Ph.D. in English at the CUNY Graduate Center in New York City, Jaime said he decided to submit the essay as part of a final project this semester. 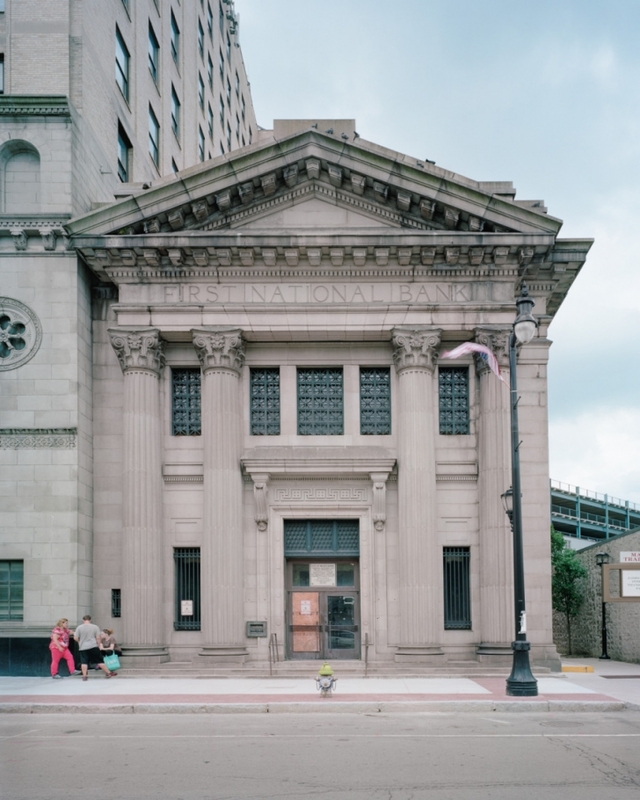 “As I began photographing I couldn’t help but register the headstrong optimism in these buildings, the grandiose way in which they were fortresses built to last— all that in contradistinction to what they’re used for now,”writes Michael on his web site. The image shown here was taken in Wilkes-Barre, PA last summer during Michael’s Saltonstall residency.